The goal of this common CRISP-NMR project is to combine total X-ray scattering coupled to pair distribution function (PDF) analysis and NMR spectroscopy for structural (and dynamical) characterization of non-crystalline or semi-crystalline materials, such as host-guest systems or nanocomposites. This includes methodological and instrumental developments carried out by the CRISP and NMR teams as well as the use of various modelling and numerical simulation approaches. The structural determination and analysis of nanoscale objects and nanocomposites is a very delicate task. For that purpose, we use a combination of total X-ray scattering methods with pair distribution function (PDF) analysis, and solid state NMR, which provide the structural organisation with atomic resolution and dynamics informations. 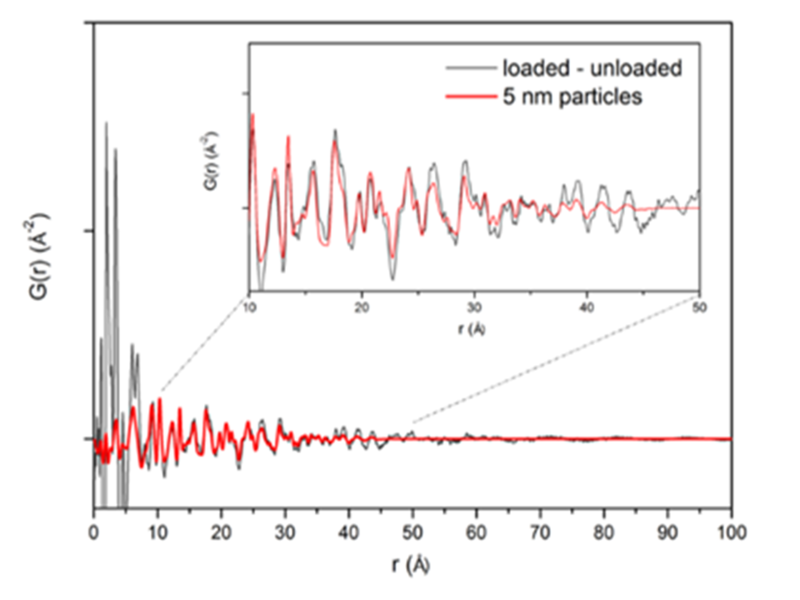 nanocomposites by combining pair distribution function analysis and solid-state NMR. Hsieh et al. RSC Adv., 3 (2013), 26132. 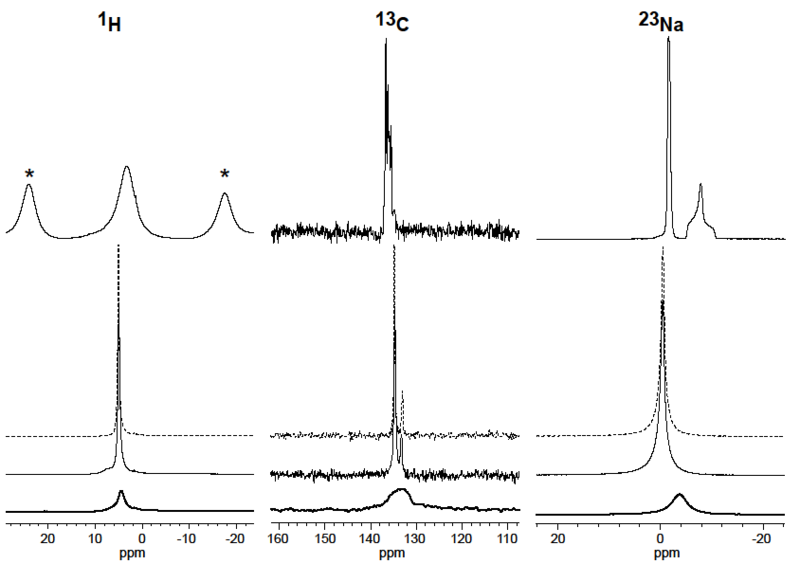 High energy X-ray total scattering with atomic pair distribution function analysis (PDF), together coupled to Solid State NMR techniques, allowed to investigate the structural properties of isolated Sodium nitroprusside (SNP) molecules incorporated in the 1nm nanopores of mesoporous silica matrices. The atomic PDF shows that the SNP complexes are embedded in the form of isolated molecules inside the matrix pores. 29Si MAS NMR measurements show that the gel matrix structure is not modified by the SNP embedding procedure. 13C and 23Na MAS NMR measurements show that inside the matrix pores the SNP neither takes a crystalline like structure nor does it adhere to the pore surface. The confined complex adopts solution like structure and dynamics with isotropic reorientation below the μs timescale. Subsequent NMR experiments at different relative humidity levels show the presence of weakly interacting water molecules inside the pores. Structure determination of molecular nanocomposites by combining pair distribution function analysis and solid-state NMR. Bendeif et al. RSC Adv., 5 (2015), 8895. Sodium nitroprusside (SNP) nanocomposites were prepared by embedding SNP molecules in transparent mesoporous silica monoliths of well controlled porosity and narrow pore size distribution around 6 nm. The nanocomposites were caracterized by X-ray total scattering coupled to atomic pair distribution function analysis (PDF) and solid-state NMR spectroscopy. The PDF analysis allows the identification of various existing phases: SNP isolated molecules and SNP crystalline nanoparticles with the same molecular structure as the bulk crystalline material. The multi-nuclei Solid State NMR investigation confirms the structural model proposed by the PDF analysis and assigns the isolated molecules to dynamic disorder of a solvated phase. Deligey et al., Bridging Structural and Dynamical Models of a Confined Sodium Nitroprusside Complex, J. Phys. Chem. C 122 (2018), 21883. In order to complement the PDF based structural model of confined Sodium nitroprusside (SNP), an active pharmaceutical ingredient (API), the drug is encapsulated in biocompatible amorphous silica matrices and characterized by Solid-State NMR. 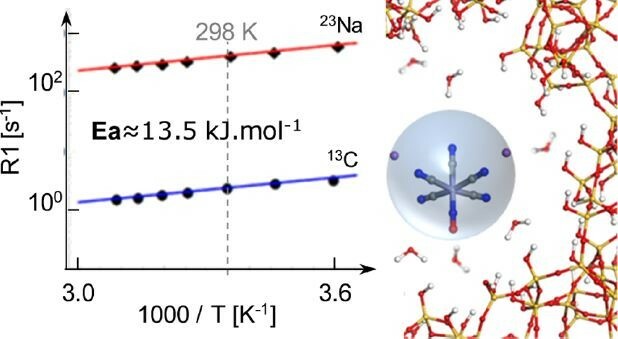 By performing temperature-dependent T1 relaxation experiments on samples with different hydration levels, we follow the dissociation of the complex by retrieving the respective motional activation energies for all three guest species inside the pores (Sodium cations, nitroprusside anions and water). For the hydrated samples we identify a temperature range where the SNP ions remain associated while expressing an isotropic and correlated motion. For the driest samples however, we detect host guest interactions that unravel adsorbed guest populations interacting with the pore surface. These interactions, which are masked by the presence of water in hydrated samples, clarify the exceptional ability of SNP to crystallize inside mesoporous silica matrices.